I love condiments. I always have. French fries are goo but honestly they are just a vessel to get the ketchup into my mouth. I like to dip my food. I like to use my fingers to eat sometimes and I like to be able to play with the flavors in my mouth just by dipping my food into different condiments or condiment combinations. Luke agrees with me to an extent and luckily Maddy is fallen in line with her parents on this subject so meals that are dip-able are generally a hit. Almond Crusted Chicken is always a hit. Always. Luke likes the protein boost the almonds give his chicken dinner. I like the crunch of the almond crust on the chicken and I like knowing it is healthier that your average breaded and fried chicken. Maddy likes knowing she is going to have access to “dip-dip,” that is condiment to those of you who are not fluent in Maddylish. There is a bit of bread in this recipe but the almonds play a much bigger role, getting you more flavor, more texture, and more protein all with less bread and flour. I have used this recipe to make whole chicken breasts as well as chicken tenders and they were both a hit. And since they are baked and not fried they are a lower fat version of a classic meal. And you can dip ’em, did I mention that? If using chicken breasts pound them out to about 1/2 – 3/4 inch thickness. For a simple and quick how to see: Kitchen How To: Pounding Out a Chicken Breast. 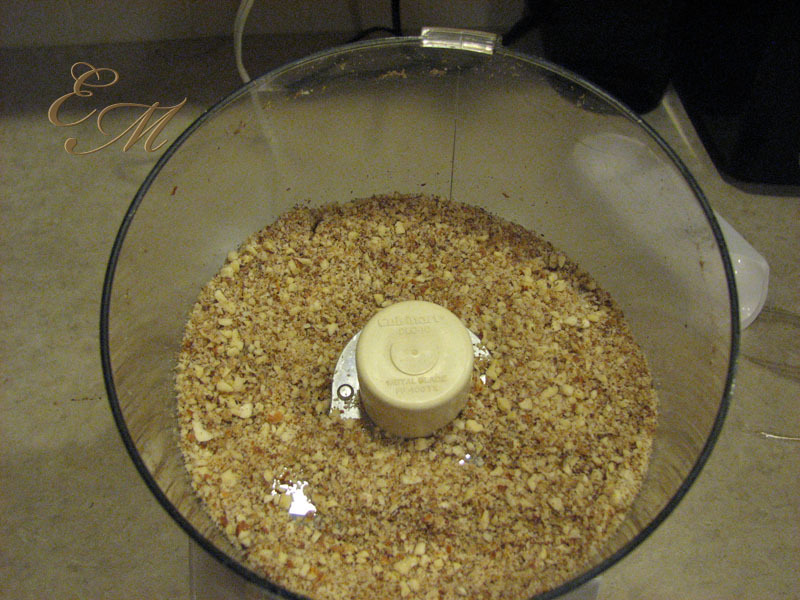 In a food processor mix almonds, garlic cloves, oregano, parsley, Parmesan and bread until the mixture looks like fine bread crumbs. The finer the mixture the better is sticks to the chicken. Beat eggs in a shallow bowl or pie plate and pour almond mixture into a second wide shallow bowl or pie plate. The wider the better. Dip the chicken in the egg wash using one hand making sure to thoroughly coat it. Then using the already dirty/wet hand move the chicken into the almond mixture. 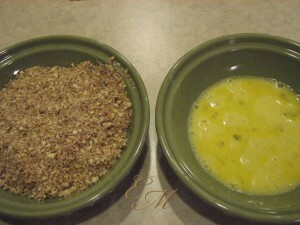 Using your clean/dry hand sprinkle and coat the chicken with the almond mixture. 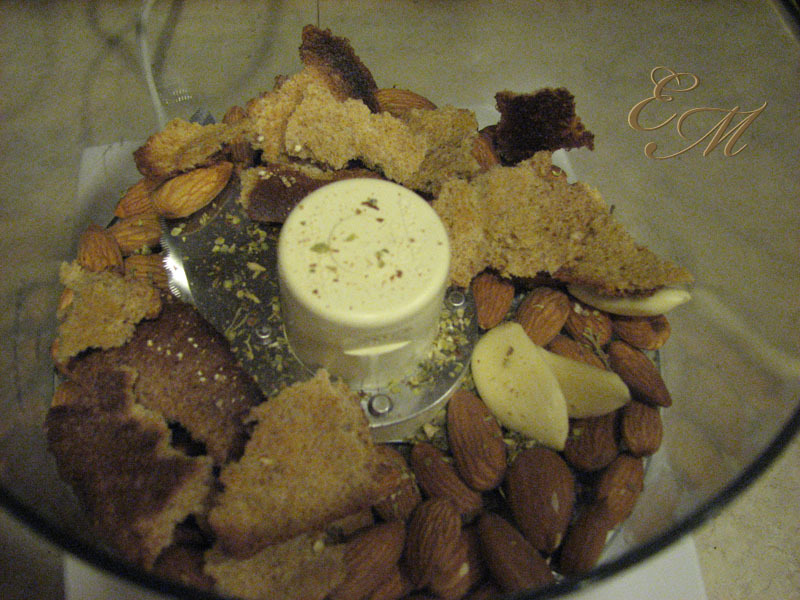 By using one hand as the wet hand and one hand as the dry hand it will help avoid having all of your fingers coated in almond mixture and it will help keep the almond mixture more manageable. After the piece is completely coated move the chicken to a baking sheet and repeat the process with the remaining chicken. When all chicken tenders or breasts are coated place baking sheet in preheated oven. Cook for about 15 minutes or until the chicken reaches an internal temperature of 160 degrees Fahrenheit in the thickest part of the chicken or until the center of the chicken is no longer pink and the juices of the meat run clear. I highly suggest using a digital kitchen thermometer as it is an easy, quick and no nonsense way to make sure your meat is thoroughly cooked. Serve with your favorite dipping sauce and finger food sides and enjoy. *This meal can turn into a fun family dipping party by serving a variety of dips and condiments to share amongst the table. 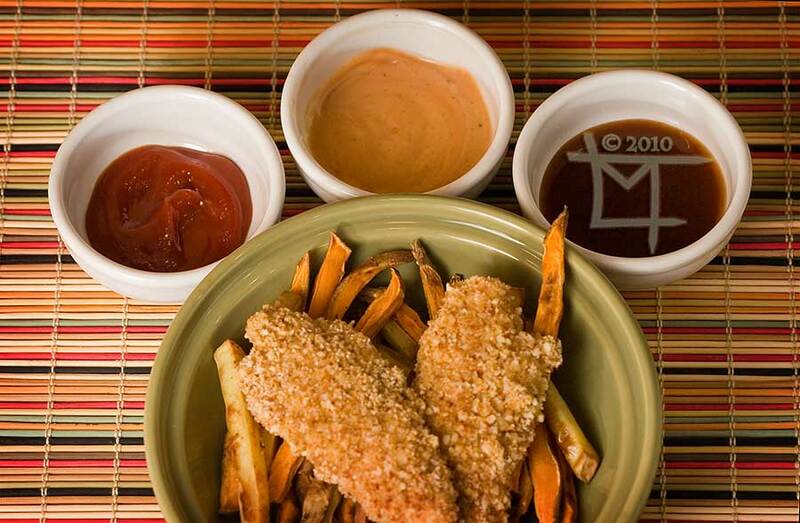 We’ve used barbecue sauce, ketchup and a mayo/barbecue sauce mix in the past although you could certainly use mustard, sweet and sour sauce, a balsamic reduction, honey mustard, warm honey, ranch, Thai peanut sauce, really the dipping possibilities are endless. I love the way you cook. You recipes are awesome. Okay if you love sauce….I am just saying that the world’s best sauce ever is Chick-fil-A sauce. Seriously that stuff is amazing. And we found out that you can buy it in tubs because they cater….I am not kidding. Hubby has gone through two tubs full…in one month! Ohh and your chicken sounds divine. Charlotte won’t let me deviate from my Frosted Flake chicken, as she loves anything sweet…however, I bet hubby would like this one. I love the first photo of the dip-dip, and I absolutely love condiments and sauces, though usually I’m too lazy to provide them when I’m cooking! I’ve made a recipe very similar to this one before. Yummy!